Tennessee’s fourth largest city should be remembered by visitors for more than a choo-choo song. With a mild climate that’s neither too hot nor cold for outdoor adventures, Chattanooga offers plenty of ways to enjoy the beautiful scenery or to challenge your muscles to the max. Getting ready to hang glide. 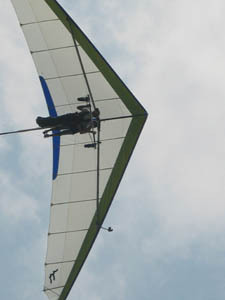 Hang gliding off Lookout Mountain: Soar through the clouds, feeling free as a bird while gliding through the sky over Lookout Mountain Flight Park. 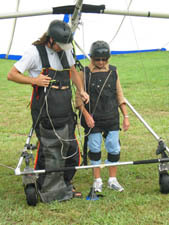 After being strapped into a protective harness, first timers ride tandem with an experienced instructor. The ride starts when an ultra light plane tows the glider and its two passengers up to 2,000 feet and then releases it for a gradual descent (about 12-20 minutes). This procedure has made possible the dream of quiet flight for millions of people who never imagined themselves jumping off a cliff while hanging onto a kite-like structure. 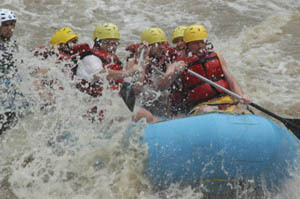 White water rafting on the Ocoee River: One of the most rafted rivers in the country, the Ocoee River near Chattanooga provides thousands of people each year with an opportunity to splash and dash their way through exciting class III and IV rapids. More than 3,000 river guides are kept busy each summer running five miles of rapids with names like Grumpy, Double Trouble, Table Saw, and Hell’s Hole. In a pact with Tennessee Valley Authority that has allowed commercial rafting since 1975, the water past the dam is drained from the river every night for use in produce hydroelectric power. Early every morning, before the first runs start at 8:00 a.m., the process is reversed, filling the river in about an hour and a half.